Pictures by Sjurlie Photography, model Chantall (B92 - T75 - H105, height 1.78m) wears a size M.
New collection! 50s Lucille blouse Bow Chiffon Black from Collectif. Elegant fifties vintage style blouse with round collar and 2 loose straps at the front to make a bow. 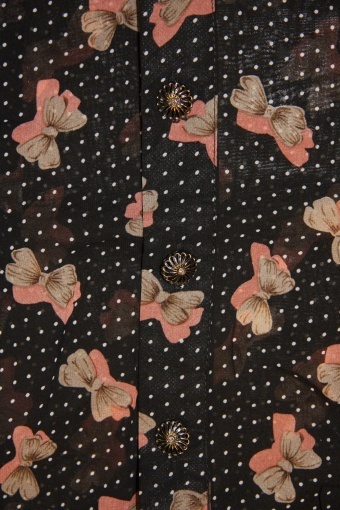 Made of a light chiffon (mix poly-cotton-spandex) in black and a cute pink/taupe bow and small white dots. Nice details are the vintage style small silver buttons. This short top is perfect to be tucked unto a high waisted pencil skirt for a truly vintage look.